Senior staff members for some Democratic senators at the center of the effort to craft health-care legislation are weighing the idea behind closed doors, Senate aides said. That’s it? Color me unimpressed so far. In any case, this whole thing is ridiculous. The issue here is highly caloric sweeteners, not soda per se. 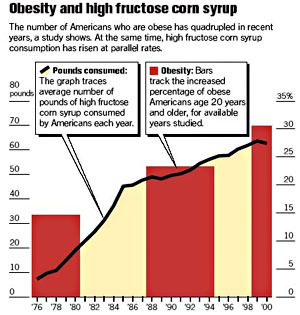 In other words, high fructose corn syrup, which is what virtually everyone uses to sweeten their drinks these days. So why on earth would we tax Pepsi at a penny an ounce at the same time that we massively subsidize HFCS? And even if we got rid of the subsidies, which would be a fine idea in any case, why tax soda? If this is the direction we want to go, why not just tax sugar and HFCS directly, regardless of what it goes into?